The official recognition ceremony took place Mar. 25 in Kuki. 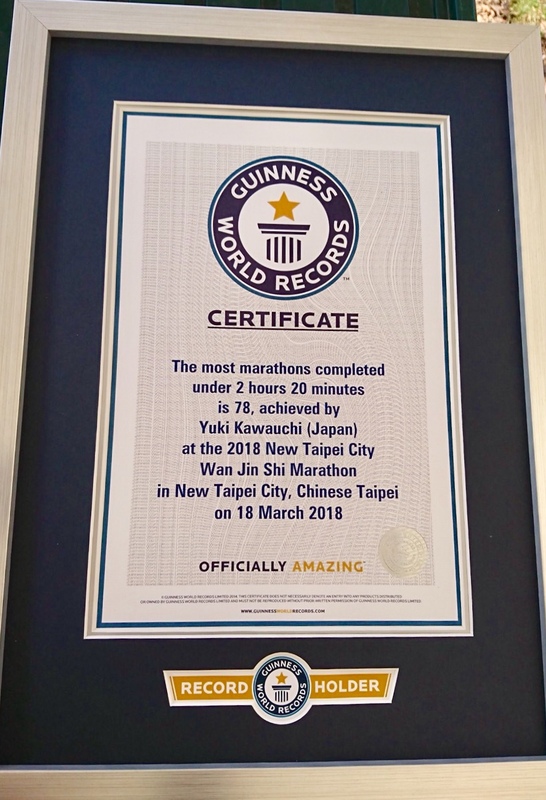 Kawauchi smiled as he received the certificate, commenting, "My style of training involves me running about ten marathons a year, and thanks to that I was able to set this world record. 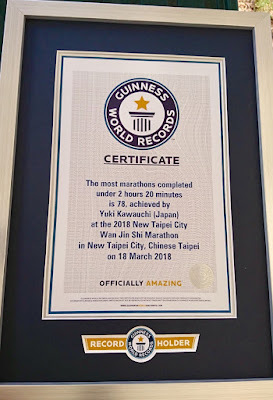 I'm very happy to have been recognized as the Guinness World Record holder, but I'm not satisfied with 78 times. I'd like to take it further, to 100 times or even more." The ceremony followed Kawauchi's appearance at his hometown Kuki Half Marathon, the same race where he previously set an unofficial world record for the half marathon in a three-piece suit.A day after running 3 x 5000 m at the Heisei Kokusai University Time Trials meet, this year Kawauchi ran the Kuki Half in a full-length panda costume, outkicking his younger brother Yoshiki Kawauchi to finish 2nd overall in 1:10:03 only 40 seconds behind winner Takemaru Yamazaki. Kawauchi changed into regular clothes before being recognized for his world record.